The paperback will be ready somewhere around that date as well. I’m sure you’d like to hear more about the book and see the Awesome New Cover, right? The waiting is over! Daniela of MV Covers has knocked it out of the park again with this awesome design. When the goddess of the sea chooses a young girl named Riwenne to be her champion, can Riwenne fight for what she believes? In a utopian floating city, Riwenne dreams of serving the gods as a priestess. Then she gets a message from the sea goddess urging her to become a warrior. Mechanical beasts are attacking innocent people on the streets at night. 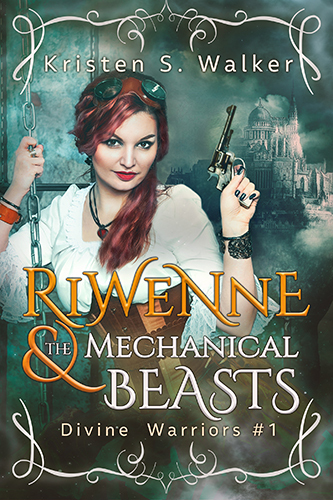 Armed with the power of the goddess, Riwenne must learn to fight. But if she wants to save the city, she will need to decide who is a friend and who is an enemy—and the wrong choice could have deadly consequences. I’m so excited for you all to finally read this book after I’ve been writing it for literally twenty years! Book 2 is already in the works, and I’m also writing a prequel short story as an exclusive gift for my newsletter subscribers. So, if you’re not already on my mailing list, now is the time to join. You’ll get the prequel novella for A Flight of Marewings right now (which will be replaced with the story) and then the new short when it’s available. And stay tuned for more behind-the-scenes sneak peeks at the making of the new story. It’s changed a lot of over the last two decades, so I’ve got lots of old material to share.